Use id5 Tweaker to change advanced settings and optimize performance. Wolfenstein Wiki - A detailed wiki for every Wolfenstein game made. Released along with The Old Blood in a two-pack. The German Edition (aka LV Release) only includes the German language and has content differences (e.g. no swastikas). The Panzerhund Edition does not include the game or any in-game extras. The texture cache folder is not made by the game so the cache is regenerated for each session. This can fix stuttering in the game. The game will now correctly store the texture cache between sessions. The game creates two files there, one of which is 1 GB in size. This file is not deleted after ending or uninstalling the game and has to be deleted manually. Normal Windows shortcuts do not work to relocate the MachineGames folder or the Wolfenstein The New Order folder to another drive. If your Windows OS supports it, an NTFS junction point (mklink /J <link> <target>) will allow redirecting the folder to a different location. Setting command line option +fs_cachepath "E:\your_cache_path_here" should also work to redirect the cache folder. Command cannot be inserted in console during running of the game. 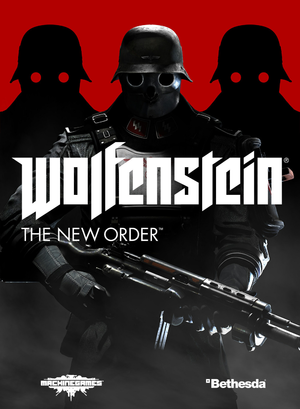 It has to be inserted as parameter for WolfNewOrder_x64.exe (shortcut - in "target", field, C:\[location]Wolfenstein.The.New.Order\WolfNewOrder_x64.exe +fs_cachepath "C:\[your created folder]") and (or) set in the Steam properties of the game->Set launch options. A slow HDD can prevent from achieving high FPS. Consider placing the file on an SSD or RAM disk. From 80° to 100° horizontal. 4:3 base. See Field of view (FOV). Press Ctrl+~ and type in r_multisamples 2 or other desired MSAA value. This will reduce jaggies on some geometry edges, but has no effect on the majority of edges in the game. Cutscenes are capped at 30 FPS. id5 Tweaker increases the upper limit of the FOV to 200 and allows changing the FOV of the hands and weapons. Find ;g_fov 100 and ;hands_fovscale 1.0. Remove the semicolons and set the desired values. 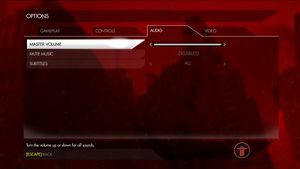 The in-game Vsync option may not work correctly if used in conjunction with G-sync, and/or if using the unofficial high frame rate mod. Go to the Video Options menu, then set Vsync to Off. Slightly less intensive than the default Vsync setting. Might cause the audio to desync during cutscenes. Remove the semicolon and set the desired value. Press Ctrl+~ to open the console. Press Ctrl+~ again to close the console. Find ;r_postprocessdofmode -1 and remove the semicolon. Find ;r_skippostprocess 1 and remove the semicolon. Can be changed by editing .cfg. Open the console with Ctrl+~ or Ctrl+\ or Ctrl+^. Use bind "key" "_action" in order to bind your keys. Use listBinds in order to view a list of actions every key is set to. Search/replace "hidden duplicate" bindings such as "_use"
This is useful for altering WSAD => EDSF layouts, as the action to exit the submarine (in the appropriate level) is bound to the "_use" action. None, foreign languages only, or always on. Use 3D Surround Gaming fix. Force vertical sync and triple buffering externally. See Force Vsync for instructions. Triple buffering is important for avoiding large fluctuations in frame rate. 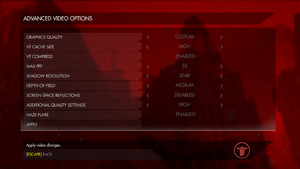 The game may crash soon after starting when using outdated graphics card drivers. Do not delete the WolfNewOrder_x32 file or else it won't work. Make sure that the two laucnh files are in the game folder, WolfNewOrder_x64.exe and WolfNewOrder_x32.exe. Steamless binary achieves few FPS more. Keep Steam in offline mode. No Internet connection. 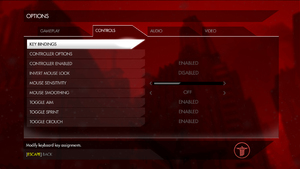 VERTICAL SYNC: OFF (you can try to force it in GPU control panel instead [only if you need it], and then turn on triple buffering in GPU control panel [normally unncecessary]). Set jobs_numthreads to 1 in the config file (in some cases; this needs to be turned on while in-game or in the wolfconfig with it turned to read only. See mutlithreaded mode fixes). Search for atioglxx.dll inside Windows folder, or use this one. Then copy the file inside the game folder. For Nvidia, you can try out searching for nvoglnt.dll file (if found), or OpenGL32.dll (if it not performs worse, and if you don't use Reshade injector). Go to Local Files and select Verify integrity of game cache. There is an issue where Catalyst AI causes the crashes. In older drivers this could be turned off in the software, but now it must be done manually. Open Profiles.xml using an xml reader (Notepad or Notepad++ works for this). Search for the Catalyst AI entries and change the value to Disable. There are two entries in the file. Save Profiles.XML and restart your PC. If the game continues to crash, don't forget to exit out Raptr and AMD Gaming Evolved. Now game works/scales properly in all resolution, including the highest ones. By default, value is set to "2". Set +fc maxcachememoryMB 1024 +vt_maxPPF "16" +vt_pageimagesizevmtr 16384 +vt_pageImageSizeUnique 16384 +vt_pageImageSizeUniqueDiffuseOnly 16384 +vt_pageImageSizeUniqueDiffuseOnly2 16384 command line argument. This works only if you have 3 GB VRAM and should fix pop in even when you do a 180° turn. If the game freezes for about 1 two 2 seconds in regularly intervalls, add +jobs_numThreads 0 to the launch options. Aiming and crouching will be almost instant, feeling considerably odd. Using the scope on the AR Marksman Rifle will no longer be possible. ↑ 1.0 1.1 File/folder structure within this directory reflects the path(s) listed for Windows and/or Steam game data (use Wine regedit to access Windows registry paths). Games with Steam Cloud support may store data in ~/.steam/steam/userdata/<user-id>/201810/ in addition to or instead of this directory. The app ID (201810) may differ in some cases. Treat backslashes as forward slashes. See the glossary page for details. As seen in the console, the value is always set to 4 by default regardless of the quality settings. This page was last edited on 15 April 2019, at 02:09.